The sun is just rising over Central Los Angeles, but already dozens of people with empty bags, boxes, and folding carts are lined up at the side entrance of Immanuel Presbyterian Church. Two generations ago, they might have been awake at this hour to begin a long day of farm work. Instead, they — and thousands of others across Los Angeles County — are up and out this early to put food on their plates another way: food pantries. Though food distribution doesn’t start until 9:30 a.m., some people arrive as early as dawn in order to have time to visit two or three more pantries before the day is over. Others come early to ensure they’ll go home with the most desirable, but more limited, items — fresh fruit, vegetables, and meat. Henry Tocay arrives an hour after the pantry, one of more than 800 food distribution sites run by partners of the Los Angeles Regional Food Bank, opens. By the time he’s loaded his two black, reusable grocery bags with canned tomatoes, rice, beans, and juice, the crowd at Immanuel Presbyterian is thinning. Just 30 minutes ago, the basement, where food distributions start, was bustling with chatter in a mix of Spanish, Tagalog, and English. Now just a few people remain, sipping coffee from styrofoam cups as they wait to for their numbers to be called up to the counter. Tocay, a soft-spoken 26-year-old, takes his time. He sits on a plastic chair in the basement, where Día de los Muertos decorations still hang, and rearranges the food inside his bags. He comes to the pantry to get food to supplement what his mom, a single mother, buys for him and his three younger brothers. The cereal and juice he gets there saves his mom, an airplane custodian who regularly works 12-hour shifts, from having to “waste money,” Tocay says. Instead, she’s able to spend more on clothes and school supplies for his brothers. For a while, Tocay’s mother was able to get help buying food through CalFresh — what California calls its implementation of the Supplemental Nutrition Assistance Program (SNAP), a federal program formerly known as food stamps. But once she started working overtime, she made too much money to continue qualifying for the program — though not enough to afford rent, her sons’ educations, and food for the whole family. As Tocay prepares to leave, the pantry is handing out the last of the perishable food it has to offer in the kitchen, mostly potatoes, sausages, and some frozen fruits. The fresh produce, which the pantry only had in limited quantities, is gone. But in the state of California at large, such fruits and vegetables are abundant — as long as you can afford them. LA was once the largest agricultural county in the United States. Today, it's the county with the largest population of food insecure people. The Immanuel Presbyterian Church, where local nonprofit Hope Net runs a food pantry every Saturday, is located in LA’s Koreatown neighborhood, less than three hours from the Central Valley’s southernmost point. 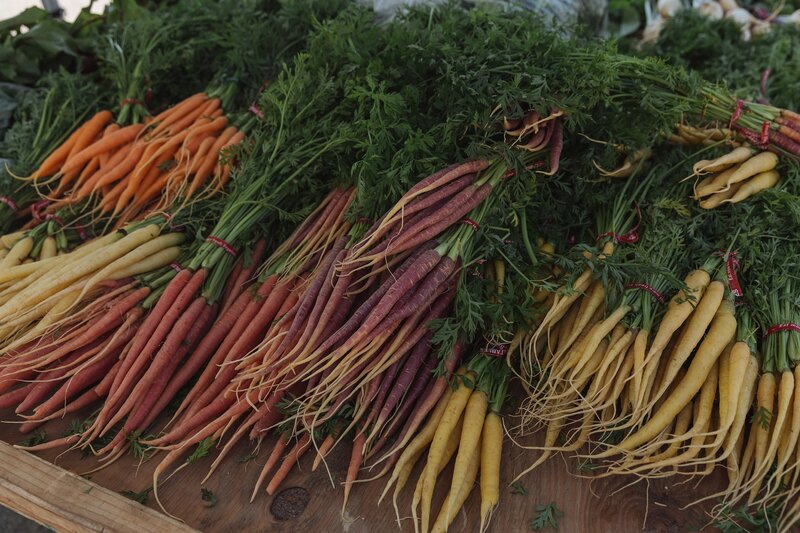 The state of California produces the overwhelming majority of the US’ carrots, celery, berries, and avocados. It’s the country’s top producer of dozens of other crops, as well as of milk and cattle, producing 2.2 billion pounds of beef in 2016. California’s not just producing enough to feed the nation, it’s growing enough to help feed the rest of the world, yet the state has the largest number of food insecure households in the US. The tragic irony is that an estimated 4.9 million people living in the state that feeds much of the country and the world are going hungry. It’s a massive and complicated problem, but nonprofits, advocacy groups, and individuals across California are rising to the challenge. While LA has a much-talked-about homelessness problem, just 5% of those who usually come to Immanuel Presbyterian Church for food are homeless, Hope Net Executive Director Levi Webb estimates. Many of the 200 people Hope Net serves during its two-hour weekly distribution have stories like the Tocays’ to tell. Some are seniors on a fixed income, but most are people from households where at least one person is working. Nearly 80% of Californians living in poverty are from households with at least one working adult, according to the Public Policy Institute of California. But wages have not kept up with the rising cost of living, especially in LA County, forcing people to decide between putting roofs over their families’ heads or food on their plates. Despite being the world’s fifth-largest economy — one spot ahead of the entire United Kingdom — California has the largest number of people in poverty in the US. And for the majority of California’s 7.5 million poorest, their biggest expense is housing. “We have to remember: We don’t have a hunger problem, we have a poverty problem,” Sue Sigler, executive director of the California Association of Food Banks, says. “California has such a high cost of living that even a household with two people earning at or well above the minimum wage can find itself struggling to pay bills and also afford adequate food for everyone in the household,” she says. That’s where programs like CalFresh, the Women, Infants, and Children (WIC) program, and hunger-alleviating nonprofit organizations like food banks come in. Food banks haven’t been around as long as you might think. The first food bank in the US, and reportedly in the world, was established in the late 1960s. Over the next decade, the concept of a “bank” that gave the hungry access to surplus and donated food spread across the country as economic growth slowed and income inequality grew. Food banks were started as a “stopgap” measure, Flood says. They were meant to carry people through tough times as they transitioned back to being self-reliant. Then, and still today, pantries and other meal service programs help reduce food insecurity among people who are waiting for government benefits to begin, are not eligible for government benefits, are not earning enough to feed their households, or have lost their jobs. 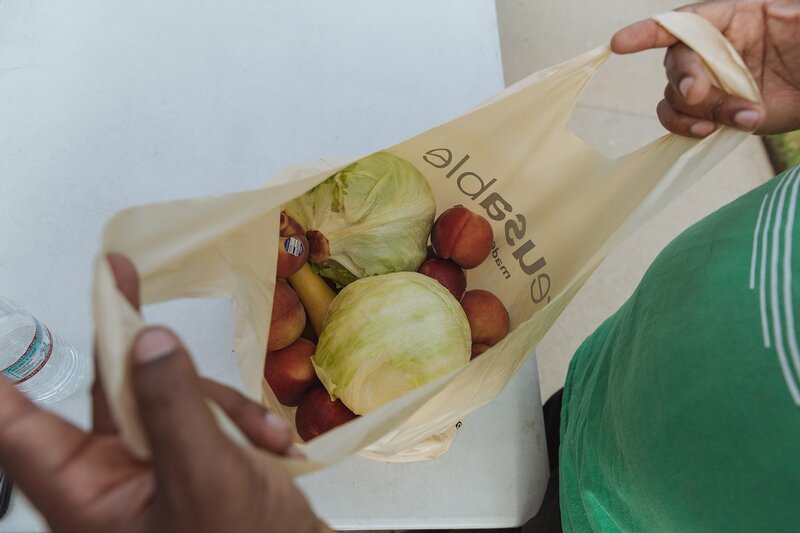 A volunteer packs fruits and vegetables rescued from becoming food waste into free bags for families from Inglewood, a low-income city in LA County. The city has limited access to healthy produce and more than 20% of its residents are living in poverty. When the economy is weak and unemployment is high, more people fall into these categories and turn to food banks for assistance — but the American economy is currently strong. So strong, in fact, that the Federal Reserve has raised interest rates and plans to continue to hike them up and unemployment is at its lowest since 1969. Yet LA’s food pantries are still seeing long lines and approximately 2 million Angelenos rely on CalFresh to get by. “The issue today for a lot of individuals and families who need food assistance is more around the cost of living. Housing is so expensive here and has continued to increase and that's put a lot of challenges on families and individuals,” Flood says. The average rent in LA County in 2018 was $2,267. To afford this, someone working 44 hours a week would need to make over $13 per hour — more than minimum wage, $11 in California — and spend their entire income on rent. Now, 45 years after the LA Regional Food Bank opened, the county has such a large number of hungry that even though the organization helps feed more than 300,000 people a month, hundreds of thousands are still food insecure. About a million pounds of food flows in and out of the LA Regional Food Bank’s two massive warehouses in Central LA every week. It’s the kind of large-scale operation you would expect of a large corporation like Walmart, not a nonprofit. In its 96,000-square-foot Downtown warehouse, forklift trucks move crates of fresh, local fruit and boxes of the same kind of organic spring mix that retails at Whole Foods for $5.99. Volunteers sort food in refrigerator and freezer rooms that are large enough for a family of four to live in. Of course, there are plenty of the dried and canned goods the term “food bank” likely brings to mind, but the organization has worked closely with local farmers over the past decade to get more fresh produce into the bank. The food has been donated by supermarkets, retailers, local growers, manufacturers, wholesalers, and individuals. And throughout the day, staff and volunteers from the bank’s 650 partners pull into the loading bay and fill their cars, vans, and trucks with donations to cart off to pantries and distribution points. Some of the food has been rejected by retailers for damaged packaging or being “ugly,” some is approaching its expiration date and can no longer be retailed, and some is surplus — food that has been overproduced, which the government has purchased and donated to keep prices in check. But all of it is still perfectly edible. The fact that there is enough effectively free food to fill the bank’s two enormous warehouses, but millions of hungry people in California and across the US is indicative of the fact that America does not have a food production problem. Curt Ellis, co-founder and CEO of Food Corps, says the issue is "food equity." The US, with a big helping hand from California, produces more than enough to feed the whole country. It just doesn’t make that food equally available to everyone. 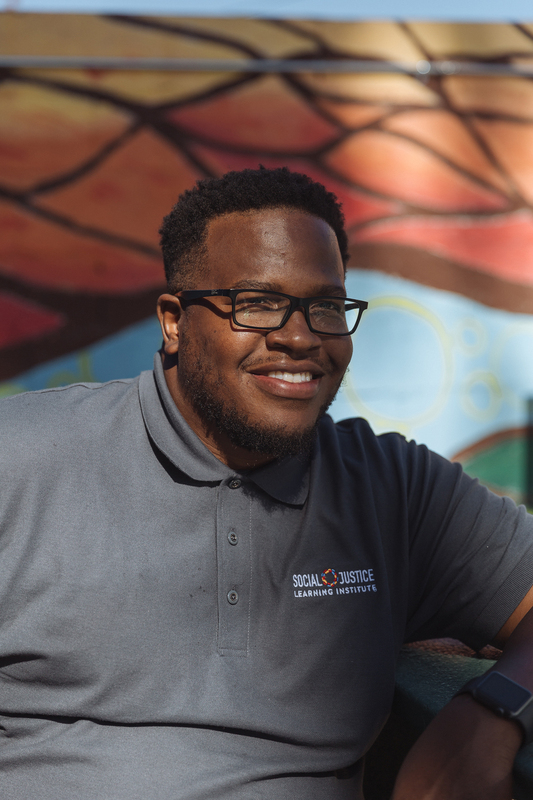 “We have a food system of the haves and have nots — a system that makes low-income families and families of color struggle more to access healthy, high quality food on a regular basis,” Ellis explains. Instead of prioritizing healthy food, the system, Ellis says, prioritizes cheap food. In theory, this should be helpful to low-income families. And in the short term, it is. But in the long-term, cheap meals come at a great cost. “Low-income people are so often put on this cycle of poverty and hunger and are forced to make the difficult choice of giving their kids the lowest-cost calories they can get and those tend to be some of the least healthy options. And that sets them up for vastly elevated rates of diet-related disease,” Ellis says. What makes things like cereal, bread, and microwavable meals so cheap? Subsidies. Many of their main ingredients come from commodity crops like corn, soybeans, and wheat, which are heavily subsidized by the US government, enabling them to be produced in abundance and made available at a very low cost. The subsidies enable crops like corn to be produced on a such a large scale that even with all the work needed to process corn into ingredients for a snack like Cheetos — which contains corn in three different forms — the final product is still really cheap. Lynetta buys produce with Market Match vouchers provided by nonprofit Hunger Action LA at the Pico Boulevard farmers market. With the vouchers, matched with her SNAP benefits — CalFresh — Lynetta has $10 extra to spend at the market each week. It’s not always the case that low-income earners buy unhealthy foods because they’re inexpensive. In fact, data shows that families using SNAP buy nearly the same groceries as non-SNAP households. Both buy a lot of soda and prepared meals, though SNAP households tend to buy slightly more of the latter. However, that data reflects the spending habits of people who are eligible for SNAP and have access to a grocery store. There are many living in poverty for whom neither is true. And the more difficult it is to access healthy food, the easier it becomes to just serve processed and prepared options, Ellis says. Eating processed foods and prepared meals cuts down on travel, preparation, and cooking time that low-income people who work long hours or multiple jobs — and there are many — don’t have to spare. “It's easy for people to read the epidemic of obesity and diabetes within this country as one of people making poor choices as individuals, but the reality is that the systems we have set up low-income people in this country in this really brutal cycle,” Ellis says. These cheap but nutritionally lacking foods are also frequently available in convenience stores, which tend to outnumber actual grocery stores in LA’s low-income neighborhoods. “In our community we have more than 130 fast food restaurants, liquor stores, and convenience stores. And that’s a policy decision,” D’Artagnan Scorza, founder and executive director of the Social Justice Learning Institute (SJLI), says. Scorza grew up in Inglewood, a city in southern LA County, at times experiencing food insecurity and homelessness. “Growing up, I remember there would be nights where all we could afford in my household was two tacos from Jack In The Box for a dollar — that was all I had access to,” he says. The veteran, who later earned his PhD in education, says his personal experience motivated him to return to his community and found SJLI. 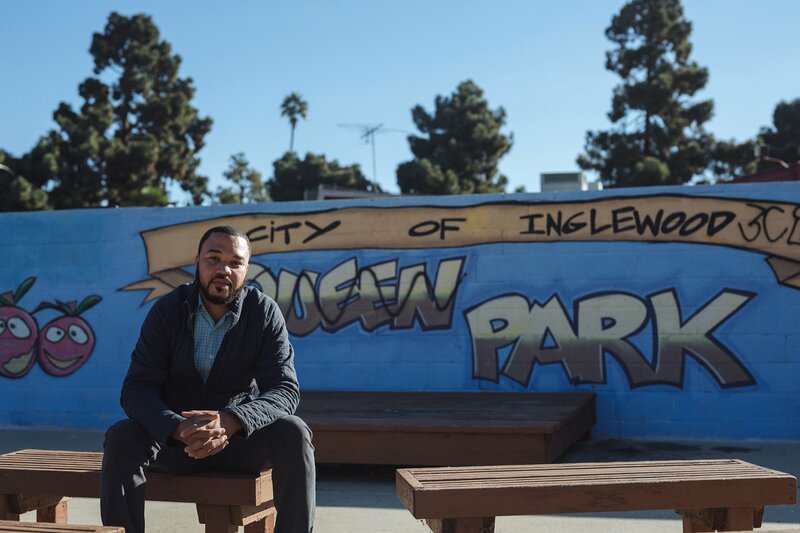 It was through his work with the youth of Inglewood, which struggles with high rates of incarceration, recidivism, and gang involvement, that Scorza noticed the pressing need to expand the community’s access to healthy food. D’Artagnan Scorza, founder and executive director of the Social Justice Learning Institute (SJLI). Though the city is just nine square miles, substantial portions of Inglewood are considered food deserts, neighborhoods that lack access to grocery stores and healthy foods. More than 20% of the city’s 111,000 residents live in poverty. How can food deserts exist in America’s “salad bowl”? Scorza points to a system that incentivizes fast food, food production on an industrial scale, the subsidizing of large producers of commodity crops, and the prioritization of profit over public well-being. “We might be able to grow millions of pounds of oranges out in the Central Valley or just 100 miles outside of Los Angeles County, but the costs associated with transporting that produce, the cost associated with housing and storing it, and making that produce accessible then makes it unaffordable for many people,” Scorza says. As a result, corporations and large grocers choose not to place grocery stores in low-income neighborhoods where they expect the community won’t be able to afford fresh fruits and vegetables. Or they don’t stock those stores with quality, fresh produce. In LA, wealthy neighborhoods have more than twice as many supermarkets per household than low-income neighborhoods, which are often home to communities of color. Similar trends hold true across the US. A sign in the garden of SJLI's office advocates for healthier food options in South Los Angeles, home to many food deserts. The area has many fast food restaurants, convenience stores, and liquor stores, but fewer supermarkets. The lack of grocery stores in low-income areas means the people who can least afford to take the time and effort to travel to stores that sell fresh, affordable produce must do so, assuming they have access to transportation. Nicole Steele, a resident of Inglewood, was one of those people. In 2010, she had grown weary of her long walk to the supermaket, so she came up with a proposal to build school and community gardens in the city to increase her community’s access to fresh, healthy foods. 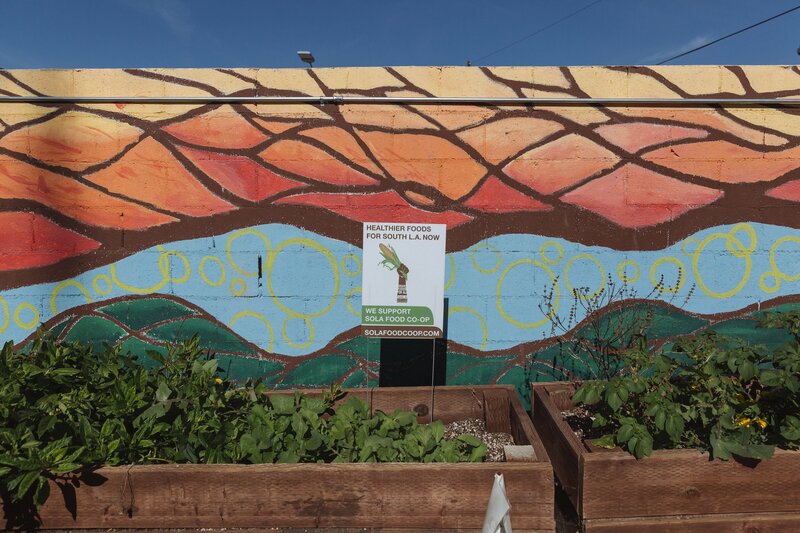 That evolved into SJLI’s 100 Seeds of Change program, through which the organization turns underused urban spaces, home gardens, and school land into edible gardens. Today, Steele is SJLI’s health equity programs manager and, with her husband Derek, the director of health equity programs, has helped create more than 100 gardens in Inglewood. 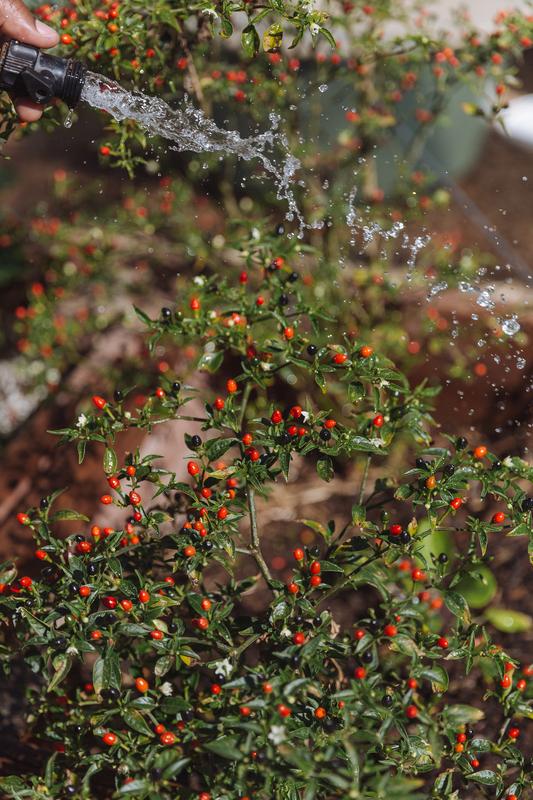 The gardens, which community members help maintain and can eat from, grow everything from tomatoes and collard greens to rosemary and squash. Over the past eight years, Derek says he’s seen a shift within the community. Families who weren’t concerned by their lack of access to healthy foods in the past are now “agents of change” who have joined SJLI in calling for greater access to fresh produce and are raising awareness of food injustice within their community. Director of Health Equity Programs at SJLI. Derek Steele waters vegetables at the community garden located at the SJLI office in Inglewood. Plants in the community garden at the SJLI offices. The fruits and vegetables grown in the gardens are also added, at no cost, to boxes of food the organization sells through its community-supported agriculture (CSA) program. This enables SJLI increase the amount of food that goes into the CSA boxes without increasing the price, but the majority of the produce comes from local farmers and is the same produce sold at farmers markets. By making the boxes available at a convenient location within the community, SJLI is systematically tearing down barriers to Inglewood’s access to healthy food, but in many parts of LA County, those barriers are still firmly in place. Lynetta, an elegant woman in her 50s, grows vegetables and citrus fruits in her garden, but doesn’t produce nearly enough food to feed her family. 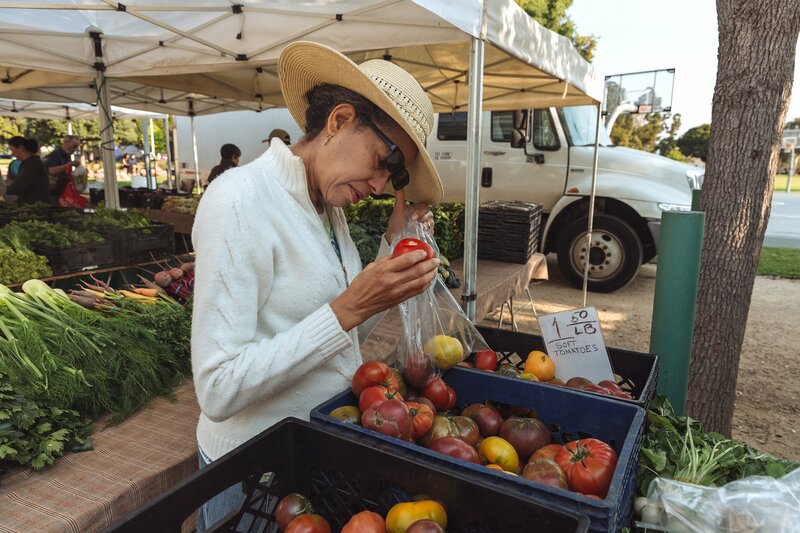 So she’s always one of the first people to arrive at the farmers market on Pico Boulevard on Saturdays, driving about 12 miles — which, in LA traffic, could take up to an hour — to make it there right as the market opens at 8 a.m.
Lynetta at the Pico Boulevard farmers market. “I do that because although there's a farmers market near my home, the produce is not even close to the quality that I can get here,” Lynetta, who chose not to give her last name, explains. The city of Santa Monica, where the market is located, is one of LA County’s wealthiest areas. It has multiple farmers markets — including LA’s largest, which sells to the public and several upscale farm-to-table restaurants — and dozens of grocery stores, including specialty and organic stores. The fresh food options in Lynetta’s lower-income neighborhood are vastly different. The Pico Boulevard has the "freshest of food," Lynetta says. 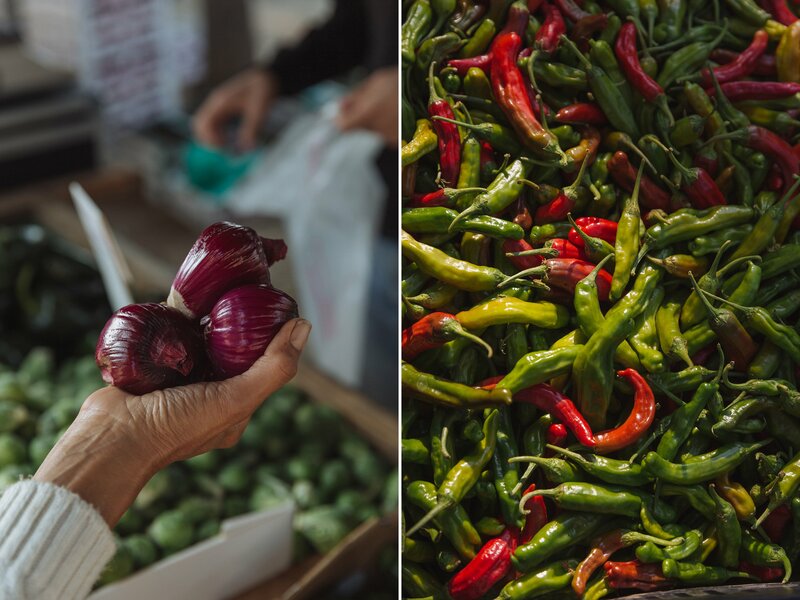 It’s also one of 23 farmers markets across LA where the nonprofit Hunger Action LA offers its Market Match program, a service Lynetta has used for the past few years. Lynetta has two degrees and is bilingual, but after leaving her job to care for a family member living with a disability and then re-entering the workforce over the age of 50, the only job she was able to secure is part-time. Having missed out on 20 years of income and now working a part-time job, she requires government assistance to feed her family. So Lynetta comes every week to shop at the market where she can use her benefits and receives extra money to spend on fresh, local produce from the Market Match program, which matches the value of CalFresh and disability benefits up to $10 and social security benefits up to $5. (L) Lynetta buying onions through the Market Match Program. (R) Fresh produce at the Pico Boulevard farmers market. 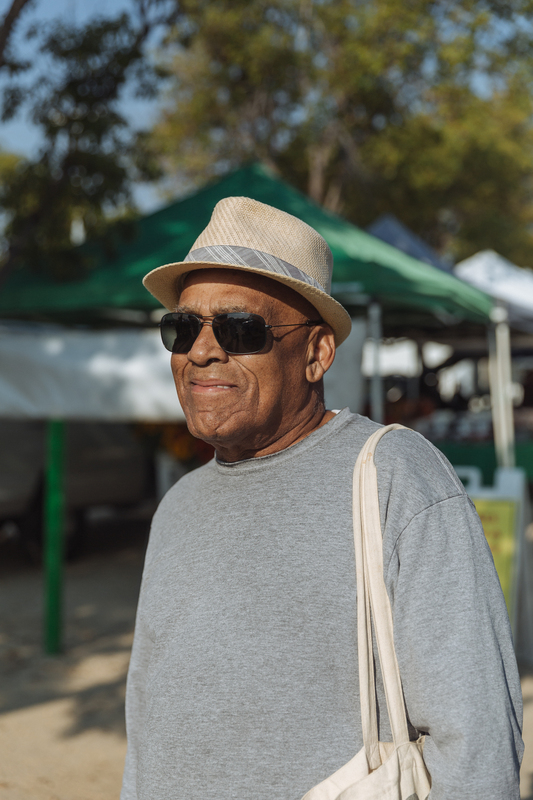 The program serves about 60 people every week at the Pico Boulevard market, Hunger Action LA’s Market Match Associate George Worthy estimates. Across the county, the program serves approximately 1,000 people a week, most of whom are living with disabilities, seniors on a fixed income, are working and using CalFresh. Approximately 3.8 million people in California used CalFresh in August 2018, accounting for 10% of all people using SNAP benefits in the US. Throughout the country, more than 38 million people — nearly 12% of the US’ population — get assistance from SNAP. The program is open to both citizens and non-citizen who meet the its qualifications, including work requirements. SNAP is touted by experts as one of the US’ most successful poverty reduction initiatives, helping millions of people to lift themselves out of poverty every year. Its positive impact is complicated, multi-fold, and indisputable. The program does much more than just increase access to food. In 2017, the average SNAP beneficiary received approximately $126 per month — about $1.40 per meal. In all, the federal government spent about $70 billion on SNAP and other food assistance programs in 2017, but experts say the benefits to the economy far outweigh the expense. Every dollar of SNAP benefits that a household spends helps generate $1.79’s worth of economic activity, government research shows. And a lot of that supports farmers, retailers, food producers, and their employees, who often struggle with food insecurity and low wages themselves. In fact, about 30% of SNAP benefits in 2017 were spent at farmers markets. In California, where farming is a massive industry that has been criticized for its poor treatment of workers, those dollars can have a major impact. 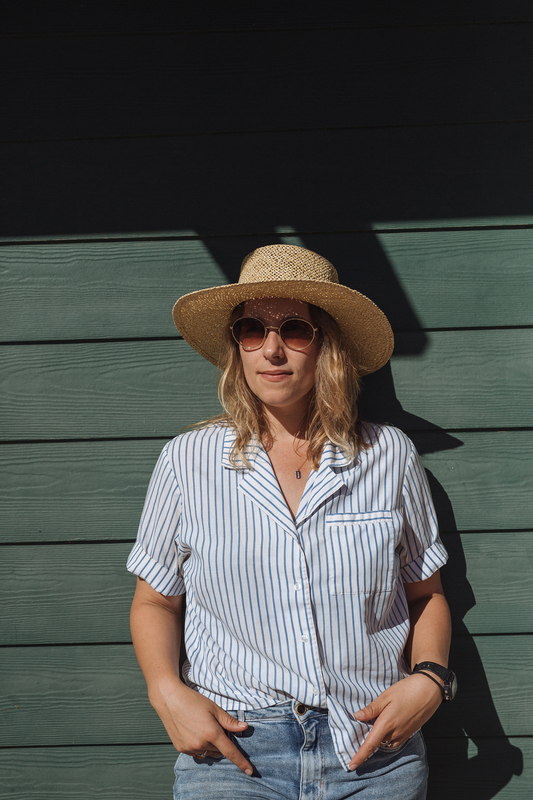 "I've lived here most of my life, in Santa Monica, and it's really a great opportunity. I know people at work who don't have something like this [farmers market] near by. There are certain things you can't find in the store." 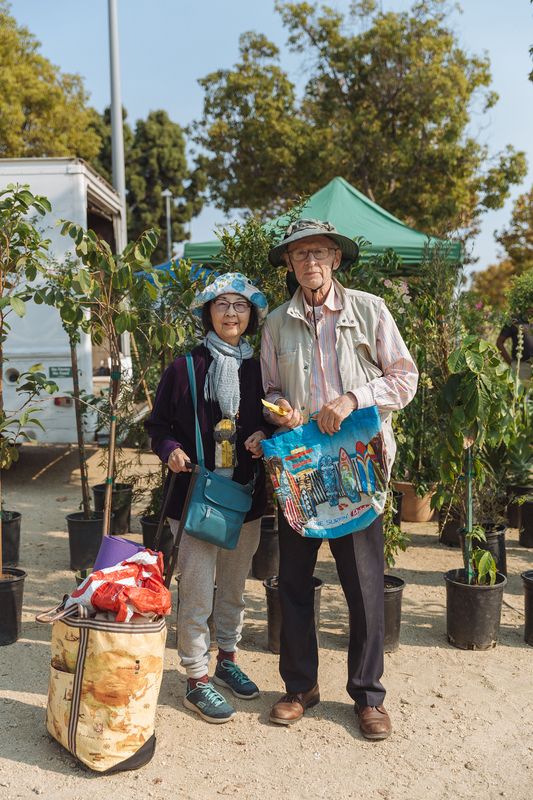 "I come here every week and I buy apples and vegetables and it helps me financially quite a bit. I'm on a very low fixed income. I am on social security and veterans pension, my income is under $15,000 a year...So you can imagine how much I appreciate a program like [Market Match]." "I'm a part of a parent group that have children with disabilities, we're all kind of struggling with that same issue [food affordability], but everybody that I know is using the program at one market or another... The farmers markets that are closest [to Inglewood] are not as big as and tend to have more processed and prepared food versus just the fruits and the vegetables." 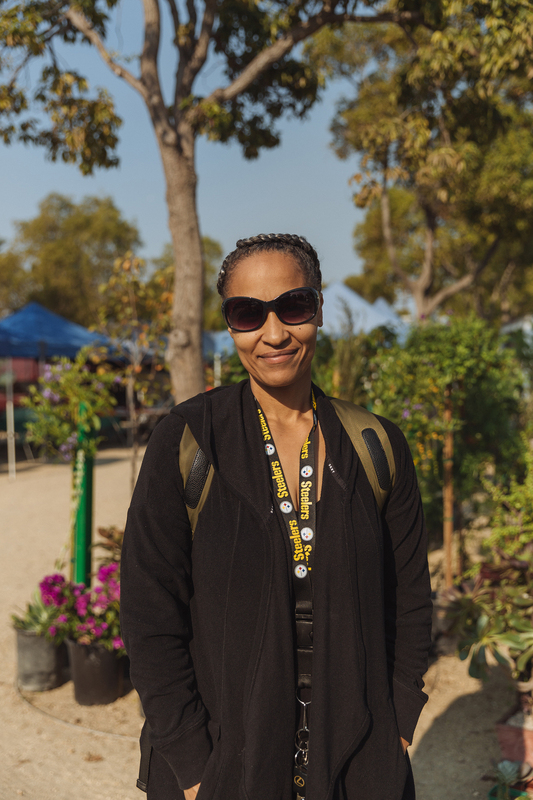 "I'm a community gardener in Santa Monica and I work in social services... I also qualify for Market Match and I've been shopping at this market for a long time. [It] helps me afford the vegetables that I may or may not buy if I was paying cash." 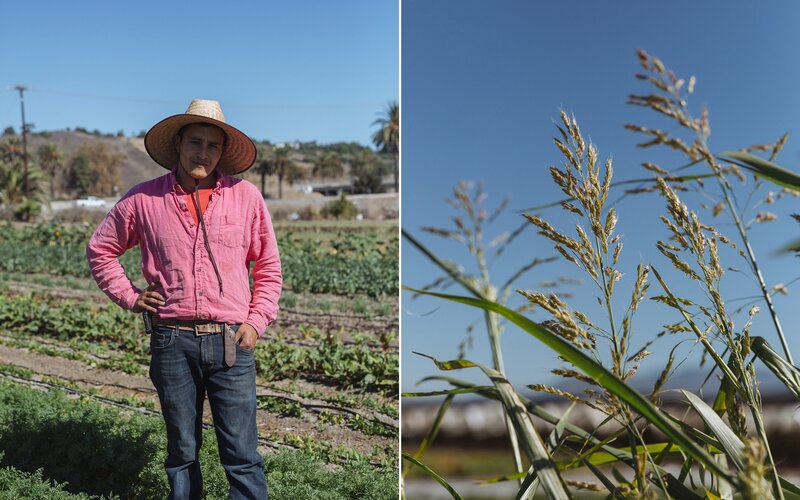 Originally from Michoacán, Mexico, Carranza has now worked for 20 years on McGrath Family Farm in Camarillo, California — a little over an hour-long drive from LA. The father of four makes a liveable wage working on the small, family-owned organic farm. He also has his own plot on the farm where he grows flowers that he sells at farmers markets for additional income. “During the weekends, my family and I go to the markets and I feel happiness in my heart to see that people like what we produce for them. That definitely gives me the strength to continue,” he says in animated Spanish. Carranza’s story is unique, a more common story among California’s farm workers, the majority of whom are immigrants, is the one Carranza tells of life before working on McGrath Family Farm. For a while, he worked on larger, conventional farms, harvesting strawberries for an hourly wage. He worked long hours to support his kids — but at times it wasn’t enough. His family couldn’t afford help, which meant that when his kids were young, their mother had to care for them, and could not work full-time. 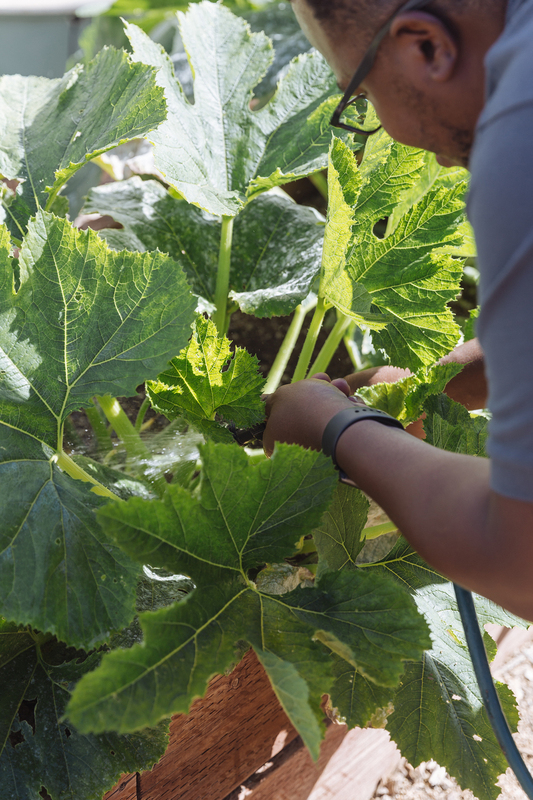 Though nurturing organic crops requires more work than growing conventionally, Carranza says he’s far happier at McGrath Family Farm and has been able to send two of his children to college. But there’s a reason Carranza’s story isn’t every farmer’s story: the American food system. 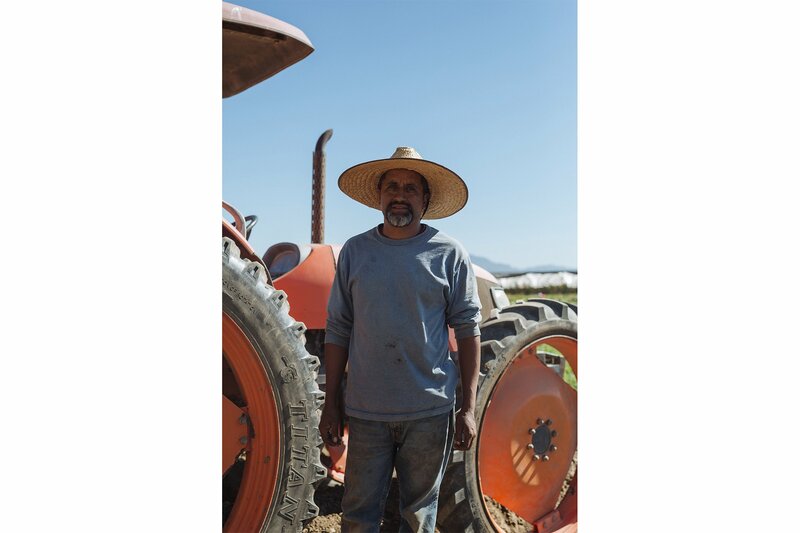 The squeeze these farms feel can make it difficult to pay farm workers a livable wage. McGrath, who is a sixth-generation farmer, says that even with the “organic boom” and the increased awareness and demand for organic products, it can be tough to stay afloat. “Larger stores like Whole Foods have taken over the market, and so while it's not really as hard as it was before to access organic food, small farms tend to have a harder time selling their products because they’re not growing large quantities to sell wholesale and can’t be a vendor to something like Whole Foods,” McGrath says. 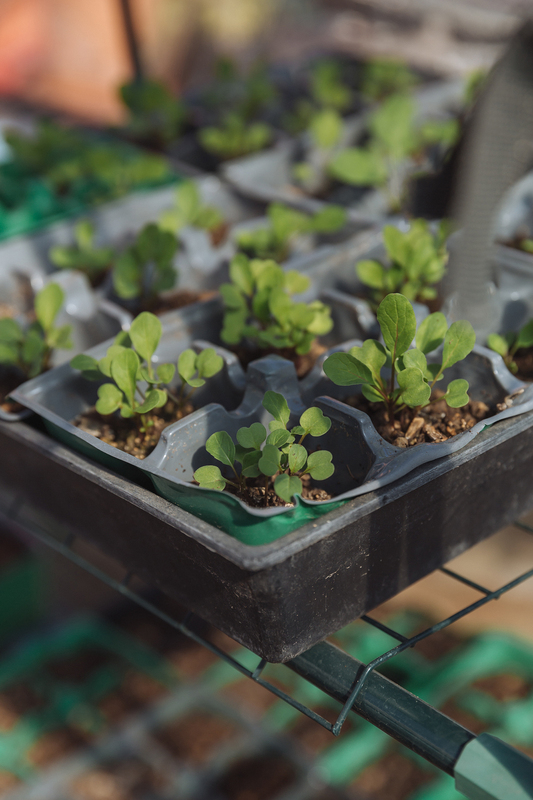 Additionally, the costs of farming — especially organic farming — on a small scale are high. Small family farms like the McGraths' make up close to 90% of American farms, yet they don’t receive the same support and assured success as commodity crop farmers. 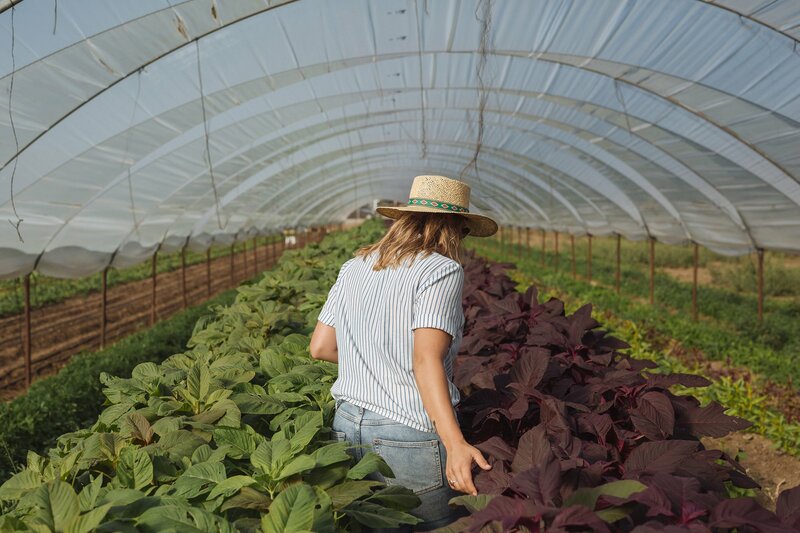 McGrath Family Farm produces a range of fruits and vegetables, including berries, greens, and tomatoes, all of which are considered “specialty crops” — defined as fruits, vegetables, nuts, and flowers. Farmers of specialty crops, what we typically think of as “healthy food,” receive less than 1% of the $20 billion in annual subsidies farmers receive. Most of that money, provided by taxes, goes to corn, rice, tobacco, dairy, and other commodity crop farmers. The subsidies come in various forms, including disaster relief, which helps farmers whose crops are damaged by uncontrollable factors like weather and crop yield survive, and “deficiency payments,” through which the government pays farmers extra when the crop’s market price falls. Overproduction or a lack of demand can cause crop prices to drop, but experts also argue that these “deficiency payments,” which are doled out to farmers based on the quantity they grow, actually encourage overproduction. Specialty crop farmers are just as vulnerable to these same variables, yet they receive little to no support. While the farming industry is notorious for underpaying and mistreating workers, when it comes to smaller, family-owned farms, often times the desire to pay a living wage is there — but actually doing so is challenging in the US industrial food system. Lola West walks through the McGrath Family Farm. The McGrath Family Farm is taking a unique approach to small-scale farming in order to survive. The farm rents out some of its land to other producers. About five acres of McGrath’s land is occupied by the Abundant Table, a nonprofit farm focused on promoting sustainability and food justice. Together they have formed a small cooperative, sharing not only land but also people and sales points. As a nonprofit, the Abundant Table benefits from grants and donations. And it sells CSA boxes in the area and has a farm store on site. But it has also found innovative ways to support itself by connecting with the community around it and inviting them in. 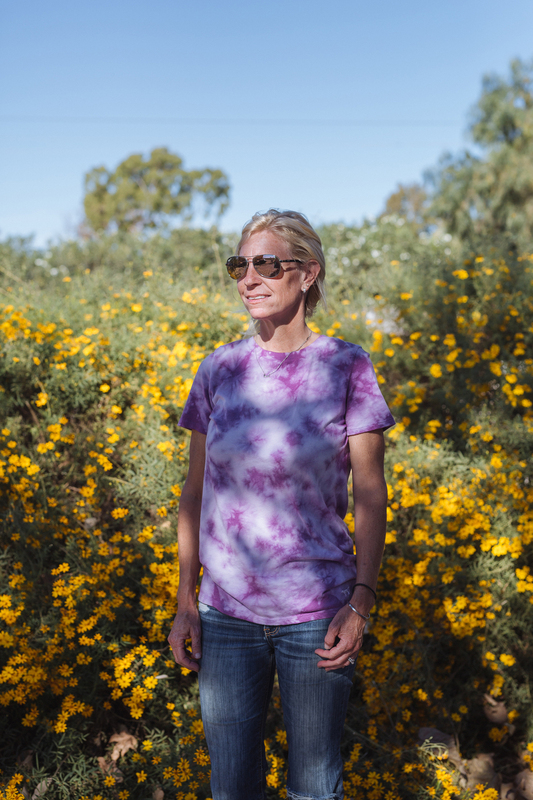 As a result, Ventura County’s community has helped the organization succeed through fundraising and other means. For now, Ban says it gives her hope that the farm continues to thrive in the face of these challenges. But still she has many concerns about the future of farming in the US, among them: the rampant sexual harassment of female farm workers, exposure to pesticides with harmful side effects — and her biggest concern — unsustainably low wages. Market Manager and Communications Specialist at the Abundant Table. General manager of McGrath Family Farm. The problem with the American food system is that it treats food like any other good, rather than a basic need. Prices fluctuate based on supply and demand — and supply fluctuates based on a variety of factors, including climate conditions and natural disasters. Subsidies help brace commodity crops farmers’ income against these factors, but farmers of speciality crops have fewer protections and support. 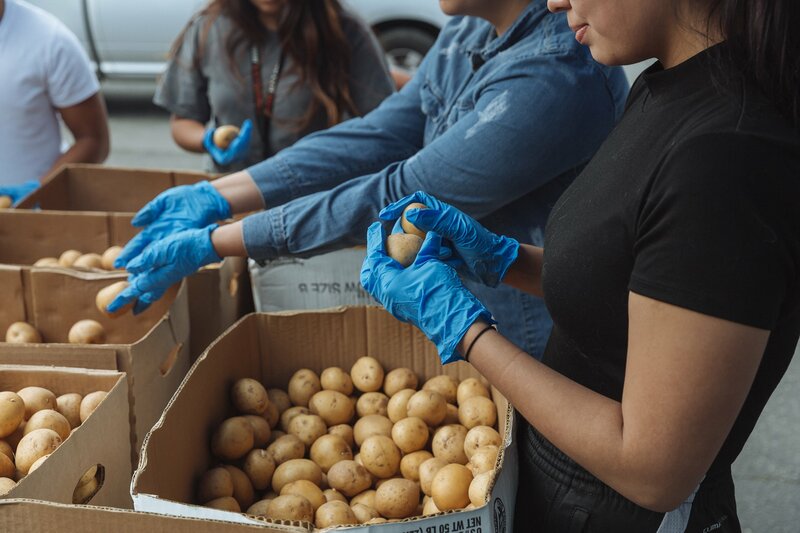 Volunteers glean potatoes recovered before they became food waste at a community event run by nonprofits SJLI and Food Forward, which invites members of the Inglewood community to bring home fresh produce. Wildfires and poor weather in 2017 reduced California’s avocado harvest, but people’s love and demand for avocados remained the same, inevitably driving the cost of the surviving avocados up. But the opposite problem — an overabundance of a crop — can also jeopardize farmers’ incomes. Cranberries are generally associated with fall and Thanksgiving, but they are the one crop many farmers will not be giving thanks for this holiday season. That’s because they have far too many of the tart berries — at least 100 million pounds too many. At the start of 2018, cranberry farmers already had enough of the fruit stored from last year’s harvest to satisfy all of this year’s demand for the fruit, which is only seasonally popular. With this year’s harvest on top of that, the farmers are saddled with way more cranberries than the US could possibly eat. In September, cranberries farmers requested permission to destroy a quarter of this year’s crop to reduce the country’s cranberry supply to artificially keep prices up — and the US Department of Agriculture approved. The measure should keep farmers from experiencing a major loss, but the cranberry industry is guaranteed to waste 240 million pounds of the fruit this year, according to New Food Economy. That’s enough to satisfy the US demand for cranberries for the next three Thanksgivings. While that seems like an astounding amount of food to waste, it’s just a fraction of what the country wastes annually. The US does not eat about 40% of the food it produces, according to the National Resources Defense Council. Food is wasted in the fields, left unpicked and rotting on the vine. It’s wasted in the transportation and distribution process, during which it may spoil or be damaged and subsequently rejected by retailers. And it’s wasted by stores, restaurants, and individuals that just can’t sell, use, or eat what they have before it goes bad. In total, the US wastes approximately 133 billion pounds of food every year — enough to close the country’s meal gap several times over. 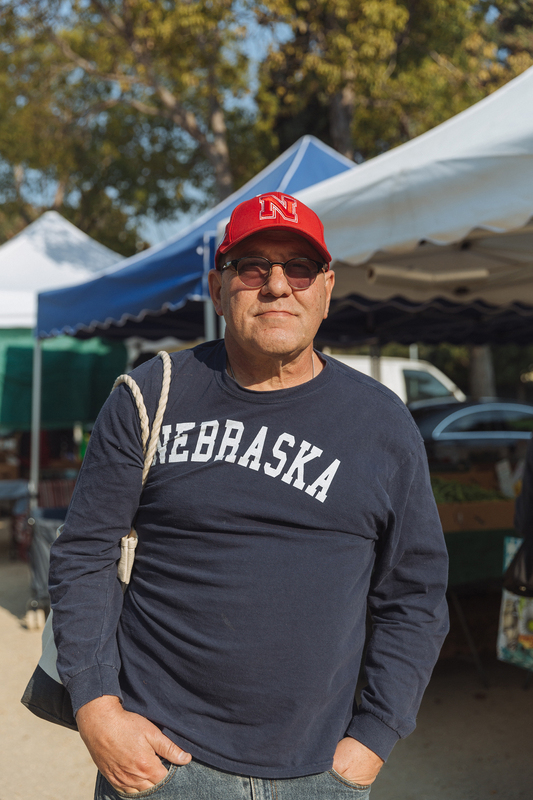 That striking paradox is what led Rick Nahmias to found Food Forward, a nonprofit that recovers surplus produce from fruit trees, farmers markets, and wholesalers to distribute to hunger relief agencies in Southern California. “We see food waste and hunger as two sides of the same coin,” Nahmias says. In 2009, during the Great Recession, Nahmias says he noticed people lining up for food assistance in quantities reminiscent of the Great Depression. Yet he saw unpicked fruits going to waste on trees in his own neighborhood in the San Fernando Valley instead of into the hands of hungry people. “America is an amazing land of abundance, and I know that sounds like a cliché, but when you look around this country … at what we have in the way of wealth of resources, of natural beauty, of the ability to have disposable income, I think people become very complacent and they forget what they have literally and symbolically growing in their own backyards,” Nahmias says. In its first year, Food Forward rescued about 100,000 pounds of fruit from backyards and kept them from going to waste. Nine years later, its network of volunteers can recover up to 100,000 pounds of produce in a single day. The city of LA has also been making an effort to divert surplus food from landfills. Its Zero Waste LA provision, passed last year, requires waste haulers to refer their clients, including grocery stores and wholesalers, to food recovery and relief organizations. “For the first time, waste hauling companies started talking to food recovery organizations and connecting so that stores, hotels, and restaurants got that information and the ability to donate food,” Fox, whose organization helped pass the policy, says. More than 4 million pounds of produce have been recovered because of the policy, she says. So much food has been rescued, that food banks and pantries aren’t even able to fully absorb and distribute it before it spoils. Time is a major factor in rescuing food waste. Food Forward has just one large refrigerator in its facility in North Hollywood. Rather than storing food in bulk at its site, the organization focuses on bringing produce to people — instead of making them come to the food — as quickly as possible. This helps to ensure the food’s freshness, but also reduces the hurdles food insecure people must overcome to access healthy food. Food for Thought: Produce Pickup event at Morningside High School in Inglewood. The organization’s joint initiative with SJLI is a perfect example of this. For the past year, Food Forward and SJLI have joined together once a month to host their Food for Thought: Produce Pickup event at Morningside High School, Scorza’s alma mater. Dozens of volunteers and staff from both organizations take over the school’s parking lot for the day where they glean recovered produce and sort it into bags. “When those students walk out of their classroom on a Friday afternoon, just a few steps over, they can grab one, two, three, bags of this produce and bring it home at no cost,” Nahmias says. One Produce Pickup will typically have 500 bags available for Morningside students and Inglewood families to pick up without having to travel very far. Nahmias says that hosting such events in the neighborhood at the school, a natural gathering point for community members, also helps reduce stigma people might feel about needing food assistance. Schools are a key entry point into and battleground in the fight against food insecurity in the US. 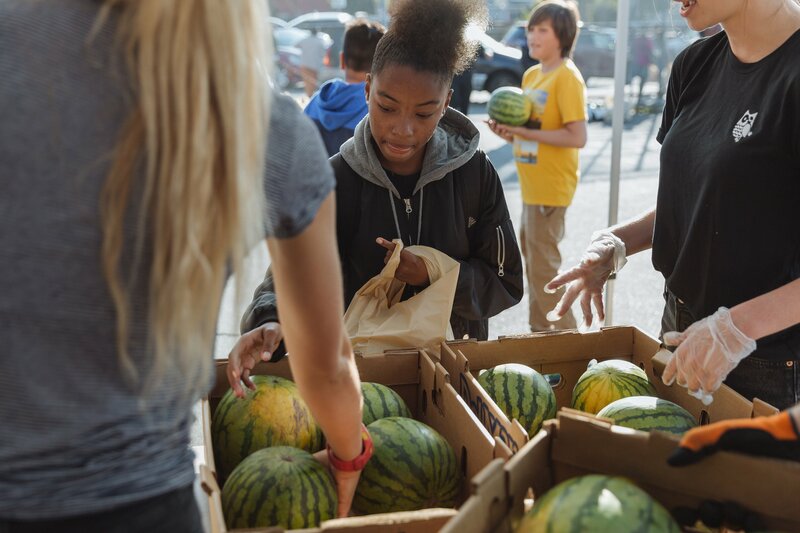 Once a month, Morningside High School in Inglewood, is the site of a Produce Pick up hosted by the Social Justice Learning Institute and Food Forward. 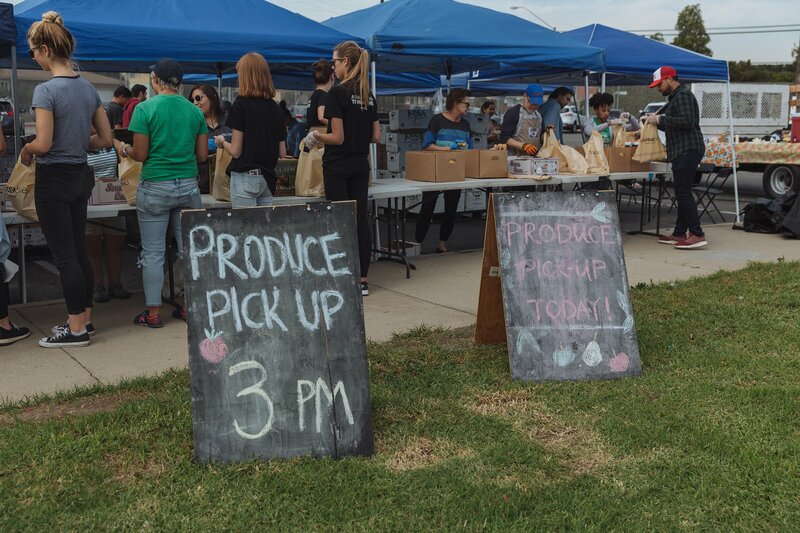 Communities members are invited to take home free bags of fresh food rescued from going to waste. As the main provider of meals for many children, schools have incredible potential to help combat hunger or to perpetuate low-income children’s access to nutritionally deficient food. Approximately 6.5 million children in the US live in food insecure households. Thanks to widespread initiatives like “breakfast after the bell,” which offers all students free breakfast, and free and reduced lunch programs, which support students from low-income families, many — though certainly not all — of these children have access to at least one reliable meal every weekday. But those meals don’t necessarily have to be healthy and, in much of the country, they’re not, says Ellis, whose organization works with schools to make sure kids have access to healthy food. “School meals are the only part of our nation's education system where we expect to make a profit and that has the effect of pushing food quality down and forcing schools to prioritize revenue rather than the nourishment of the kids,” Ellis explains. “We spend money on math because we want kids to learn how to do math and we don’t expect a profit, but we expect school food programs to break even at worst and to turn a profit at best,” he adds. Access to healthy, nutritious food is especially important for children. Without crucial nutritional benefits from healthy foods, children are more likely to have trouble focusing in class, get sick, miss school, and fall behind. Those children will become adults who suffer from diet-related diseases and may miss out on work, stall in their careers, leave the workforce earlier, or die younger. California requires students who qualify for free and reduced meals to be provided at least one meal during school days, but in addition to adopting policies aimed at reducing hunger, Ellis says the state has also been better than most about feeding kids healthy foods. 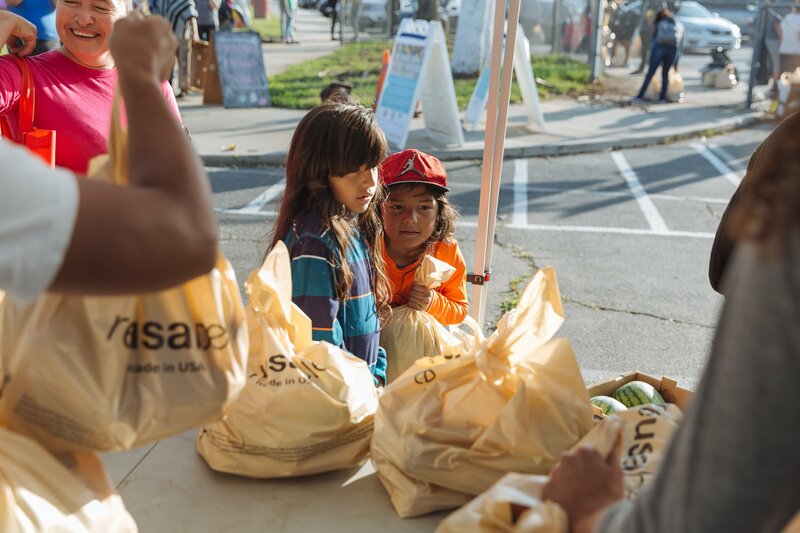 Kids are pictured at the Food for Thought: Produce Pickup event. Driven by nonprofits, California Thursdays, an initiative to get locally grown, fresh produce into schools, is now in about one-third of the schools in the state. And in Oakland and North Monterey counties, Ellis says school district food service directors have made major strides in getting healthy, high-quality food grown just hours away into their schools. When it comes to access to food, many programs and policies focus on K-12 schools, precisely for the reason that good nutrition is vital to child development, but food insecurity is not a problem that ends after high school. Around 36% of university students are food insecure. At the University of California, a public university system with 10 campuses across the state, 44% of undergraduate students and 26% of graduate students are food insecure. Four years ago, Shelly Dieu had never heard of CalFresh and had never worried about where her next meal would come from. That changed when she got to college. “For the first time, I had to figure out how to stretch $20 so it lasted the whole week,” the LA native and first-generation college student says. Now, as a geography and environmental studies student in her fourth year at the University of California, Los Angeles (UCLA), she’s a huge proponent of CalFresh, which she personally uses. Dieu says her eyes were first opened to food insecurity on her campus not through her personal experience with it, but through a class on food and climate change she took her freshman year. 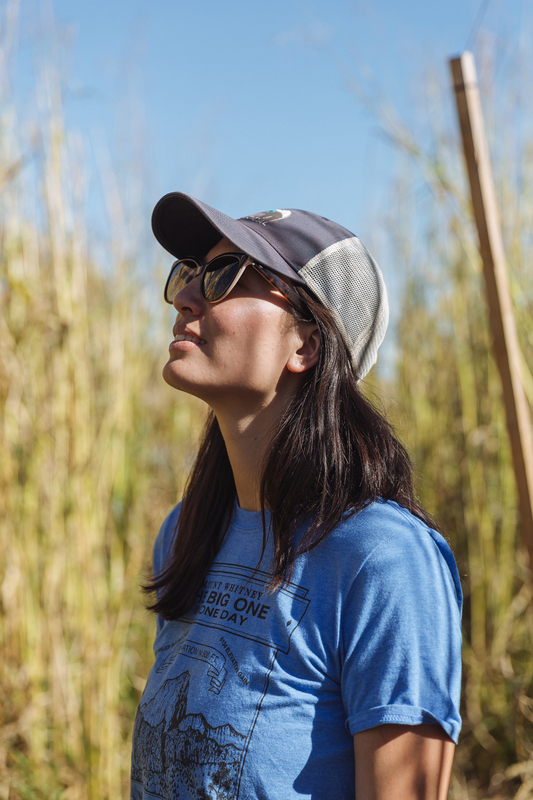 After learning about the devastating impact of industrial food system on the environment, she wanted to change her eating habits and encourage those around her to do the same. That was when she realized how many of her classmates were just getting by. Produce at the Pico Boulevard farmers market. “If you’re already struggling to pay for enough food, how can I say, ‘Hey, you should stop eating beef because it’s bad for the environment,’” Dieu says. She applied to be fellow at the UC’s Global Food Initiative (GFI), which conducts research and outreach around food insecurity, health, and sustainability. And it was through GFI that Dieu learned she was eligible for CalFresh, which she said changed her life. A big part of Dieu’s work as a fellow is now helping other eligible UCLA students sign up for CalFresh benefits. The issue of food insecurity among college students is slowly gaining wider recognition. Since 2015, the University of California has earmarked hundreds of thousands of dollars to expand hunger alleviation programs and food pantries on its campuses. The LA Regional Food Bank has begun sending mobile food pantry units to community college campuses. Food Forward has also been working to increase access to food on college campuses in the county. Nahmias says he is heartened by the interest the students have in being part of the solution though and hopes to see more people rallying to end to food waste and hunger. The bill is renewed every five years and congress is now working on passing a new version of the bill, which expired in October. So far, the proposed changes would increase work requirements for SNAP eligibility, meaning many people could lose that assistance. Fox urges people to advocate for the legislative progress they want to see. There are other policies currently up for debate that could impact food insecurity in the US as well. Proposed changes to immigration policy could make it harder for farms to find labor to harvest their crops, leading to more food waste. And policies around climate change — which Sigler, of the California Association of Food Banks, says is her major concern when it comes to both food insecurity and California’s farming industry — could also have an impact. As individuals, organizations like Food Forward and the LA Regional Food Bank welcome volunteers and surplus food. Volunteers glean and pack produce recovered before they became food waste at a community event run by nonprofits SJLI and Food Forward, which invites members of the Inglewood community to bring home fresh produce. But Nahmias says there’s an even easier way to start addressing the problem: Ask yourself what you’re consuming. “One of the most beautiful things about food is it's meant to be shared. It's a millennia-old ritual and that’s not going to go away,” he says. Dozens of food pantries and hunger relief agencies in LA will host holiday meals this week, meaning thousands of food insecure people in LA County will share in the most food-centric of American traditions this Thursday: Thanksgiving dinner. They, like many other families across the country, will be able to pile their plates high with turkey, potatoes, and cranberry. But on any other given night, they are unlikely to experience such abundance. But what the collective work of organizations like LA Regional Food Banks, Food Forward, the Abundant Table and SJLI shows is that food insecurity is a problem we can solve.